Facebook is making an app that was previously only for celebrities and other public figures available to journalists with verified profiles. By Laura Hazard Owen @laurahazardowen Sept. 10, 2015, 1 p.m.
At the same time, you’re likely to find more actual readers on Facebook than on Twitter. And Facebook wants journalists to embrace that: On Thursday, it’s offering a new app, Mentions, to journalists (and other public figures) with verified profiles, to help them share more of their work on Facebook — and to choose who, exactly, sees that work. Mentions has been available to owners of verified pages (celebrities, athletes, big brands, Nieman Lab) since its launch in July 2014. On Thursday, however, it’s opening up a bit more, to “public figures with verified profiles,” including journalists who’ve gone through Facebook’s verification process. If you want to get verified, request it here or do so after downloading the app. Mentions lets you (not surprisingly) track mentions of yourself — so a journalist could, say, find and join a public discussion of her work. For example, Jodi Kantor, coauthor of the recent New York Times Amazon exposé, has used the app to track how people were reacting to the story, and to interact with a professor who wants to include it in his class, Mentions product manager Vadim Lavrusik told me. You can also shoot and share live video from the app. That feature, launched in August, is similar to Periscope, Twitter’s livestreaming app. 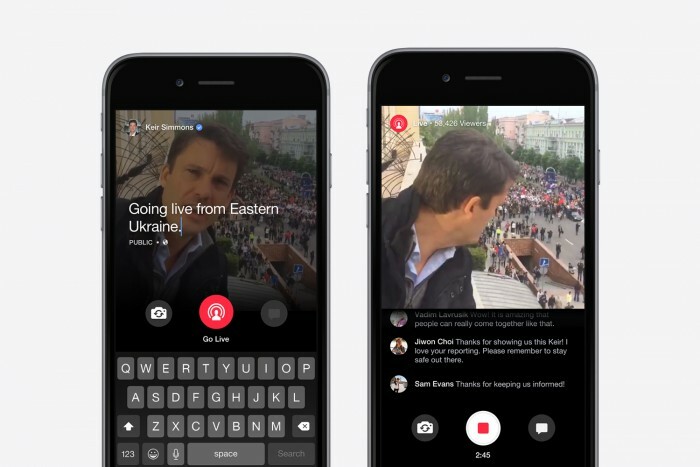 Actors, athletes, and other celebrities have used the streaming functionality for personal videos and demos, but there are clear applications for journalists, who can use it to report live from a scene and take reader questions. Perhaps most usefully, for those who don’t want to bombard their high school friends and grandmothers with articles on niche topics, the app lets users designate whether they’re posting something publicly, to their friends, or only to their followers — those who’ve chosen to follow them as a public figure. Until recently, I’d never checked my list of followers. On Wednesday, I did. (If you want to check who is following you on Facebook, here’s how; note you have to have the feature enabled first.) I have 127 of them; out of those, I sort of knew 2, and a whole lot of the rest appeared to be spammers. Still, journalists might want to give the Mentions app a try. It doesn’t take long to share a link, and there are a whole lot of people out there who don’t get their news from Twitter. POSTED Sept. 10, 2015, 1 p.m.
Owen, Laura Hazard. "Facebook rolls out new tools to help reporters share their work (and choose who sees it)." Nieman Journalism Lab. Nieman Foundation for Journalism at Harvard, 10 Sep. 2015. Web. 23 Apr. 2019. Owen, Laura Hazard. "Facebook rolls out new tools to help reporters share their work (and choose who sees it)." Nieman Journalism Lab. Last modified September 10, 2015. Accessed April 23, 2019. https://www.niemanlab.org/2015/09/facebook-rolls-out-new-tools-to-help-reporters-share-their-work-and-choose-who-sees-it/.